This brewery has been a family run business since 1422!! 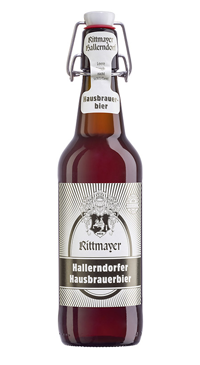 This means they started brewing even before the introduction of the German purity law (Rheinheitsgebot) of 1516. Georg Rittmayer continues this tradition today and obviously has a lot of pride in the history that comes with his beer. The beer was so well regarded by the Count of Kulmbach, that he allowed the brewery to use his coat of arms, which is still seen on the label today. What we also love about these guys, is that they are constantly innovating, whether it is the brewery or the beers. Crafted according to the Bavarian Purity Law of 1516. Once upon a time it was the right of the rural population to brew low-tax beer. In keeping with this tradition, the Hausbrauer beer is produced according to a traditional recipe. Fresh and sweet with harsh roasted malt and hops notes distinguishes this slightly dark beer from malty-sweet, Bavarian dark. Naturally bottled and animatingly drinkable.